A New Die Template to Share . . .
It’s been ages since I tried to color anything – I’m never quite sure what I’m going to end up with. 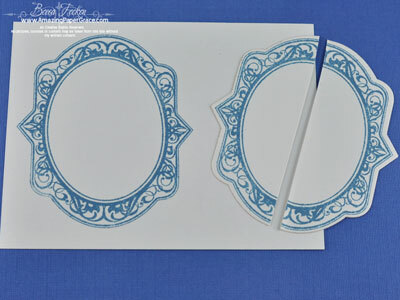 Have a peek at this new set from JustRite Stampers called With Sympathy – this is a large format 6″ x 8″ set which is larger than the sets you’ve seen in the past. If you’ve visited me before when I’ve stumbled on a great image, you’ll hear me raving about shading. Well get ready for the rave, the roses in this set are already shaded so that people who are more challenged with coloring (like me), don’t have to. 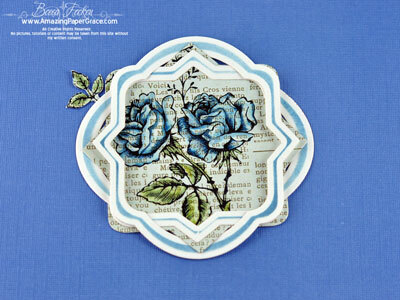 I used three colors of Distress Ink and dry brushed the roses with one color – Stormy Sky and the leaves with two shades – Forest Moss and Peeled Paint. It doesn’t get any simpler than that. I didn’t go for full watercoloring because I stamped on design paper and I didn’t want it to buckle from the moisture. By keeping my brush nearly dry, I could get intense ink in the nooks and crannies of the rose without slopping lots of color around. The end result is that it looks like you fussed around alot but you didn’t! Because my main panel is rather large, I offset it by hanging a small tag from JustRite Charm Dies with my small sentiment to balance out the card. The bow is my favorite figure eight loops bow made on The Peg Bow Maker with 5 wraps on the 2 1/2 inch width setting. 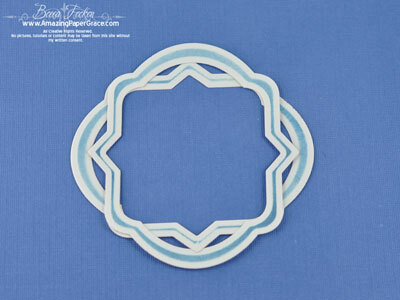 Place cut Nested Medallion Label underneath, pull pointed corners through. 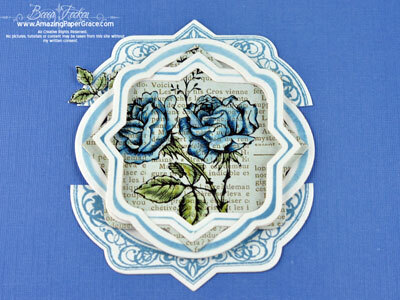 Several of the other JustRite Stampers Design Team members are ready to share their creations from this set too. 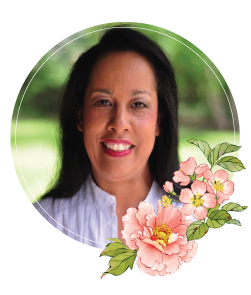 Thanks so much for stopping by – remember I have two blog candies going HERE and HERE where you can leave comments until Midnight CST on January 5th! 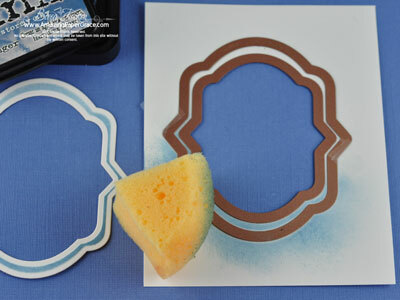 I wish I lived close enough to anywhere to peruse the new dies as they come available! Holy Schnikes Becca! You just never let us down! Every day I look at your creations and I’m amazed at your talent. You just never disappoint!! I hope 2012 is a great year for you! Thanks for sharing!! What a beautiful card you are sharing with us today Becca. You say your can’t colour but those roses are beautiful and I love the way you twist and turn the spellbinder dies to get something you like…so clever! Blue is one of my favorite colors, and I LOVE everything about this card! Another beauty!! What an elegant card, love your bow and your embellished stick pins!!! Gosh this is absoluetly beautiful. Love the frames and colors, those roses are amazing. Today you knock me out . Beautiful! It is so fun to have a master so I can just improve my work. Becca, this card is so beautiful. 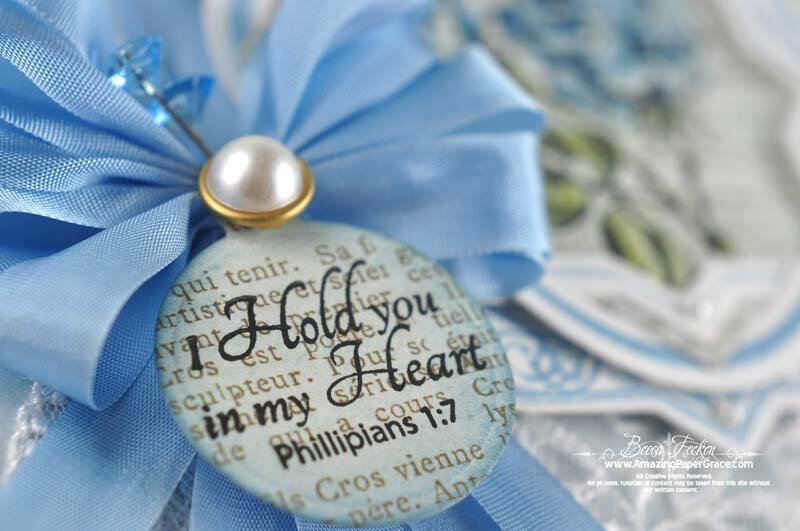 I love the layering, stamps, dies, peg bow and lace. Maybe one day I can make cards like you. It will be my goal for this year. WOW this is breathtakingly beautiful. You come up with the most gorgeous designs. thank you Becca for the tutorial on how you put this one together. I find this so very very helpfull. Your cards are just amazing and this new die set is gorgous. Oh how I would love to own this one. Dreams are a wonderful thing. Simply stunning Becca – and the colour scheme is perfect. just love the blue. Never do many cards in blue as I always felt that blue was for boys but your blew that thought away. 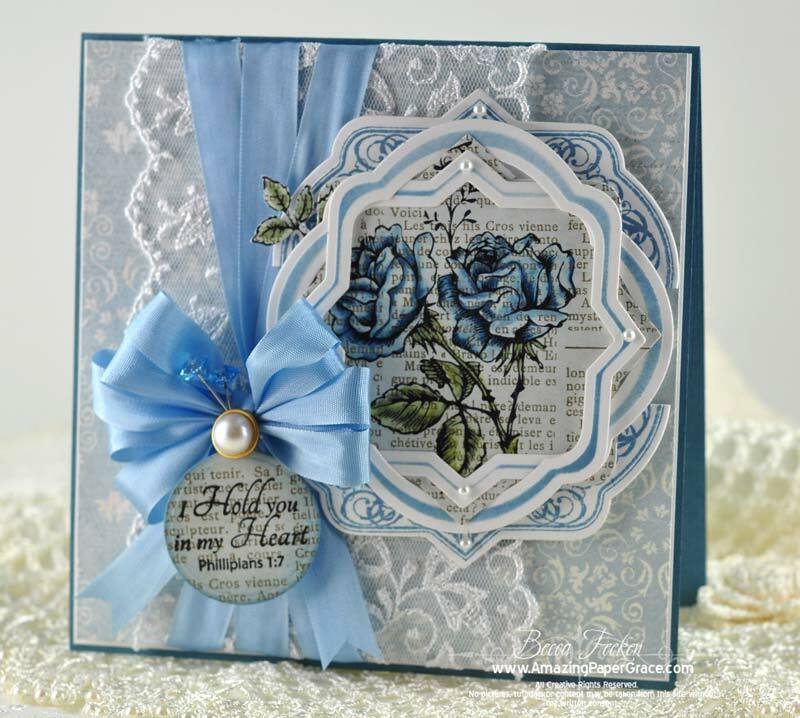 Your card is beautiful and I saw the rest of the cards on the other designers blogs and really love this stamp set with the sentiments. I really need this one in my hands. It seems like there have been so many deaths from our church recently that I need to make some cards to have on hand. It’s to much pressure to whip one out right away. Thanks for sharing and I like the steps you took to share with us like Linda mentioned. Your card is so feminine and so many sweet details, right down to the little leaves poking out of the medallions and the sparkly little pins stuck in the dainty little bow. Beautiful! Becca, I love how you layered your frames. 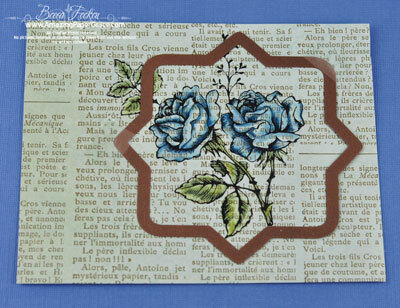 The roses on top of the patterned paper are beautiful. Gorgeous coloring and ribbon! So subtle – and beautiful! You are so generous in sharing your creations with us, Becca. Wishing you and yours a blessed and happy new year. This is a lovely card, and the dies, WELL they are to die for.